1. Start at Exit C of the Central MTR station on Des Voeux Road. Notice the trams running along the street. This street was the original shoreline of Victoria Harbour. Everything between De Voeux Road and what is the Harbour now is infill. Directly in front of you as you come out of the MTR is World Wide House. This building is the hub for the Filipina maids who work in Hong Kong. Inside you will find shops with food and items from the Philippines, remittance services, places that ship goods, mobile phone stores, and employment agencies. On Sunday’s this is the centre of gravity for the maids who come to central on their statutory day off. After looking at the street in front of you, turn left and walk past Theatre street and Chiu Lung Street. The next street will be Fa Yuen Street E.
2. Fa Yuen Streets (E and W) are both permitted hawker streets. You can buy clothes, shoelaces, etc. here. Bargaining is ok, but don’t expect much discount. Notice the stalls. These small green structures are available by permit. There are strict rules about how large permitted stalls may be and how long they can operate each day. Also stall owners are only permitted to sell specific commodities. Hawkers are allowed to have just one licence and this is transferable only to a relative and the SAR stopped issuing hawker licences in the 1970’s. You may also, however, notice that individual stalls may have been added on to, or that people are selling goods in a stall that appears to be closed, or that people are selling several types of thing. Along side the stalls are also shops. On these streets you will find clothing, shoes, jewellery, handbags, watches, etc. 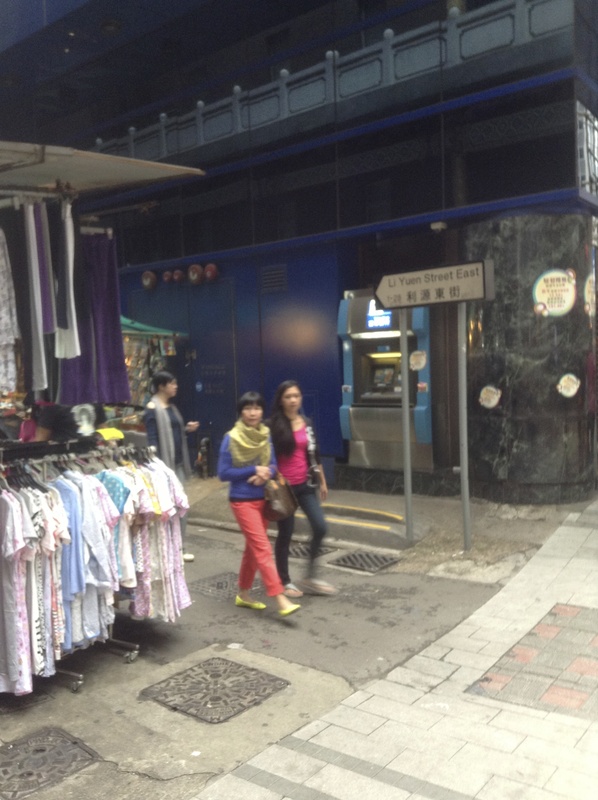 Combined, these two streets represent a smaller ladies market or Stanley Market. The english is generally good, and the prices are relatively reasonable. From Des Voeux Road walk up Fa Yuen Street (E or W) to Queens Road Central. Cross to the opposite side of Queens Road (the side where H and M is located and look to the right away from central. You will see a pedestrian overpass this is the start of the mid-level escalators and is where you are going. Walk toward the escalators and on your left will be a bank building with an escalator going up. Take this to the upper level. 3. 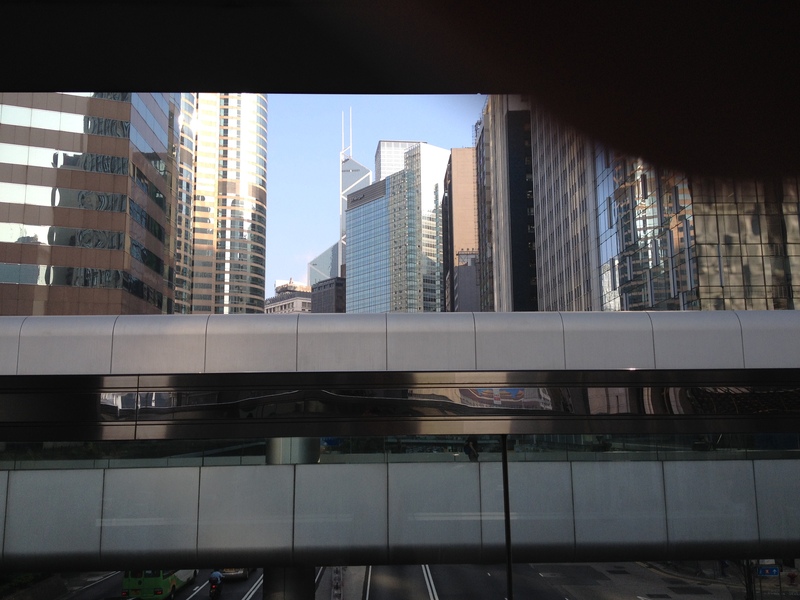 You are now on one of Hong Kong’s famous overhead walkways. Look to the right. 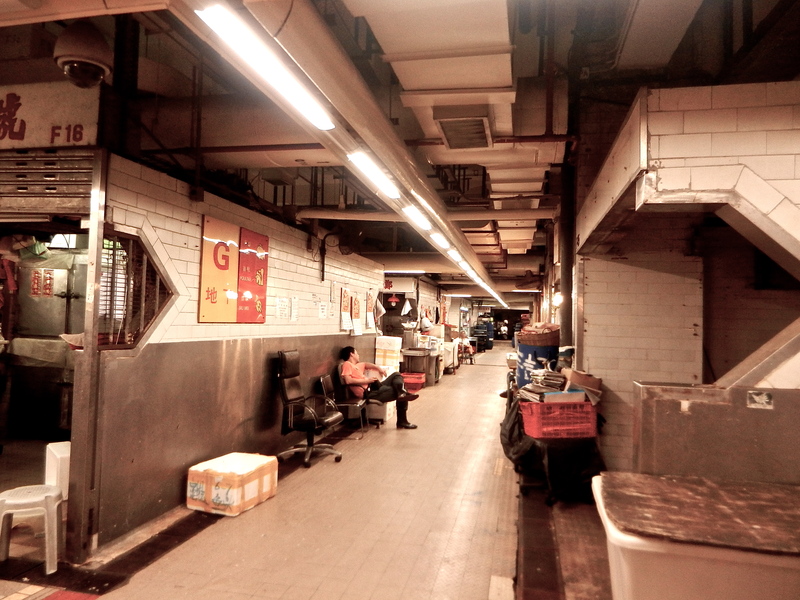 You will see Central Market, which stopped functioning as a food market in 2003. The building you are looking at is not the original market building. Prior to this Bauhaus style building, was a Victorian brick market building, which was built in 1895 and demolished in 1947. Before that two other buildings were located on the site and used as market buildings, making this location one of the oldest market sites within the city. The current building was constructed in 1938. In its hay day after WW2, the market housed the largest meat market in Asia. In 1994 the elevated walkway connecting the building to the mid-level escalator was installed. By 2003, however the market was no longer considered the best use for what is effectively prime real estate and it was closed. The only public access to the market is through the second floor pedestrian link that connects the escalator to the walkways that pass through the Heng Seng Bank Headquarters and end up eventually at the IFC complex. There is a small area used for displays and a few low end shops. As of 2012 there is still no clear plan for the building although a number of options have been suggested, including reinstating it as a food market. Rather than go into the market building turn left and join the mid level escalator. Ride up several levels until you reach the Yorkshire Pudding restaurant, where you should get off. 4. 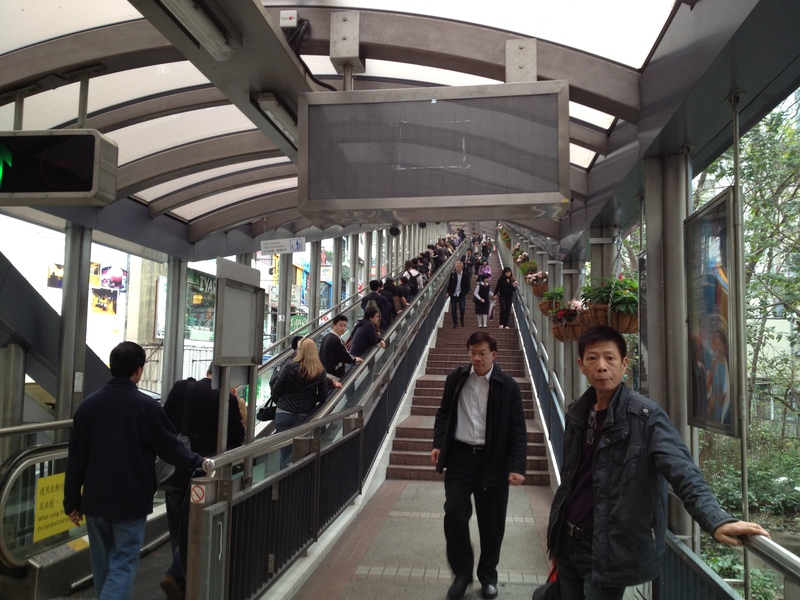 This is the famous Mid Level Escalator (the very top of which is the post photo). Along the way be sure to look down at the streets below as you will see the colourful and lively Graham Street Market. Later in the tour we will walk through this market, but the birds eye view that the escalators give offers a different perspective from which to observe daily life in this busy city. 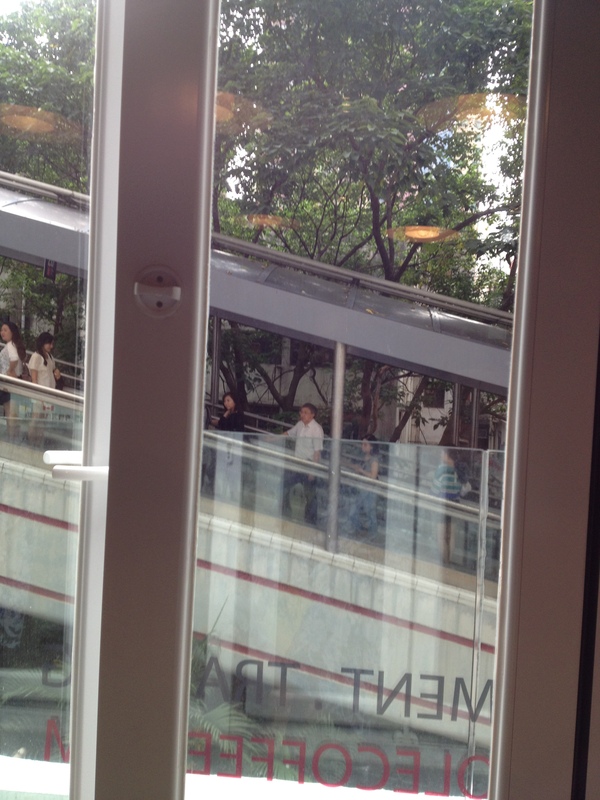 Be sure also to notice the second and third floor shops that look out onto the escalator. Now shops, once along the way you would have passed by the wonderful Rabbit Hole Coffee shop, where coffee connoisseurs would sampel different forms of brewing and different varieties of beans . On a nice day the large windows would be open and both escalator riders and coffee shop patrons would have the odd experience of watching that watchers. 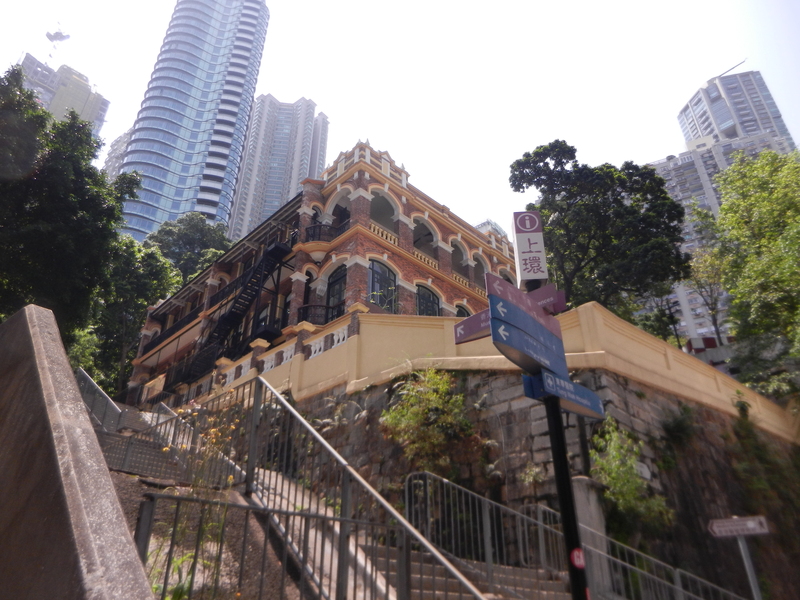 As the escalator path turns a corner and crosses over Hollywood Road, to the left the old colonial buildings that were Central Police Station and Victoria Prison. These were first built in 1841 and were closed in 2005. At the time of this writing these are undergoing restoration and will be reopened as luxury apartments and shops. 5. Exit the escalator one more street up, beyond Hollywood road. This is Staunton Street. If you are interested in Hong Kong’s famous nightlife, stay on one more street and on the left you will see Chancery Lane, along which you will find many clubs and bars and eventually the Lan Kwai Fong area all of which you can inhabit all night long). In the daytime you can take a bit of a detour here as Staunton Street and Elgin street are the heart of SoHo and are full of small restaurants and distinctive shops. Further on up the escalator just off to the left, on Caine Road is a local, innovative restaurant called IPC FoodLab (which I‘ve written about here). If you are sticking to the tour however, exit at Staunton Street, turn right and travel along Staunton Street one block. Turn right again and head down the hill. This road will take you down to Graham Street Market. As of 2014, the Market, after more than 150 years, is slated for removal, so go see it while you can (I’ve written about the demise of the market here). Walk thought the market until you reach Wellington Street. 6. At Wellington Street turn left. Walk until you hit Aberdeen Street. Turn right onto Aberdeen Street and walk up until you reach Gough Street. You are now entering an area that until recently was more residential and also less inhabited by westerners. Today it is gentrifying at a pace and there are a number of interesting shops selling home decor, as well as bakeries and small restaurants. Gough Street turns into Shing Wong Street. Follow Shing Wong Street to Hollywood Road. Turn right onto Hollywood road. Along Hollywood road you will find a number of antique stores. Some selling real antiques, some selling not so real. 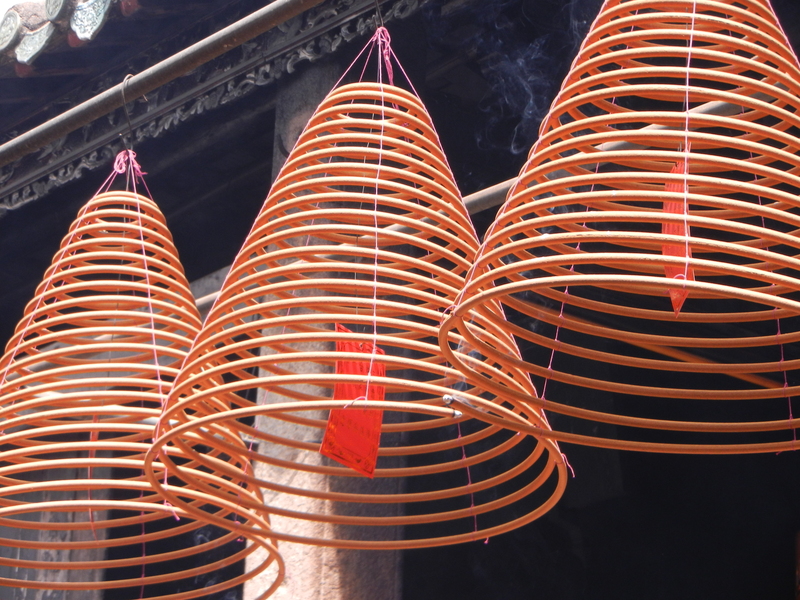 Shortly you will see Man Mo Temple. You can go inside. The temple is a tribute to the god of letters (Man) and the god of war (Mo). It is a lovely temple and the smell of incense is always evocative. 7. There is a passage on the opposite side of Hollywood road that heads down the hill. Take this down until you reach Upper Lescar road. If you head straight you will be at the top of a flight of stairs known as ladder street. There is some move to install another escalator here, but local objection may prevent this from happening. The fear is that another escalator will turn the area into a spectacle and diminish the community that exists in the neighbourhood. As you wander along you will also notice small crochet ornaments tied to various railings and surfaces. These are a result of a public arts project aimed at facilitating community belonging. Interestingly, perhaps, Sheung Wan was where the British first arrived in Hong Kong, and is much older than other parts of the urban island. It was initially referred to as Victoria City by the British. 8. At Upper Lescar road turn left. Follow this road past further antique shops and at the end you will enter Cat Street Market, which is full of inexpensive items that would be easy to take home. As with most things, buy with caution. The Jade may or may not be really Jade and remember that Ivory is illegal to import into many countries and will be seized and destroyed by many customs agents. The history of the market is interesting. Officially the name of the street where the market is located is Upper Lascar Road. Lascar is the name given to the Indians in the British Military, and this area was where they tended to live. The market grew up initially as part of this community but then became a place to buy and sell stolen goods. In Cantonese, Cat refers to the fence, while a thief is known as a Rat. Today the tourist board goes to great lengths to assure visitors that the goods being sold are not stolen. 9. At Tung Street (just at the entrance to Cat Street Market) turn right down the hill. Follow Tung Street all the way to Queens Road Central. Here Tung Street becomes Morrison Street. On the corner of Morrison Street and Queens Road Central is a municipal market. This market is one of the markets owned by the FEHD. Enter the building and have a look. You will see a considerable difference in terms of liveliness and community feel compared to the outdoor street markets. It is worth considering why this difference is so pronounced given that Graham Street Market is really just a short distance away. Perhaps this will change when Graham Street Market closes, or perhaps a new, illegal market will appear? 10. You can now follow Morrison Street straight down to Western Market, which was once a municipal market, but has been through the Hong Kong mangle of historical preservation. Inside you will find a few restaurants and a couple of tourist shops. There is fabric on the second floor, and while the quality is fine, the prices are about ten times what you will pay in Kowloon or in the fabric market at Lo Wu Commercial City in Shenzhen. It is worth, diverting to the right off of Morrison Street onto Jervois Street (before you reach Western Market). Here you will find two particularly interesting shops. The first is a rice seller. 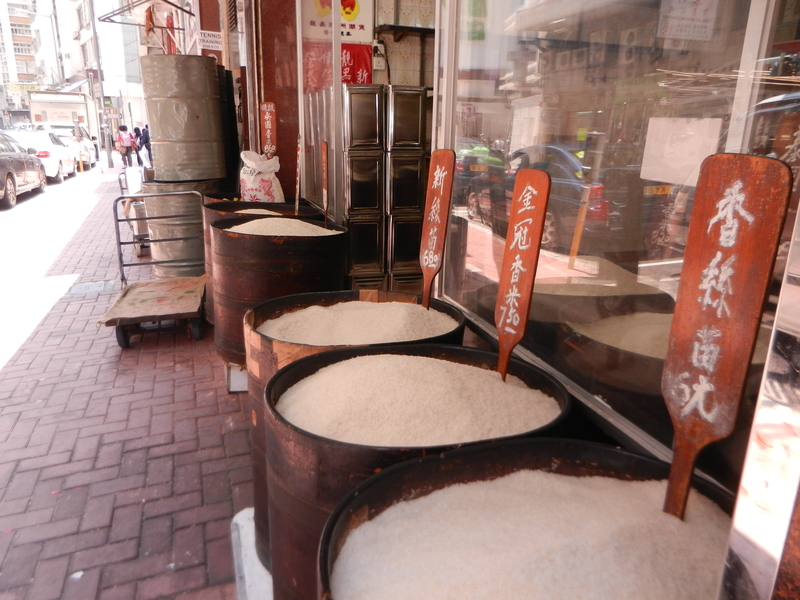 Rice was at one time heavily regulated in Hong Kong (until the late 1990’s), such that if you imported it you could not sell it to consumers. As a result, Supermarkets tended not to sell rice, which then limited their ability to offer one-stop-shopping. Once rice was liberalised, supermarket shopping expanded exponentially and most of the rice shops and small groceries disappeared. The other shop to observe along this street is a snake wholesaler. 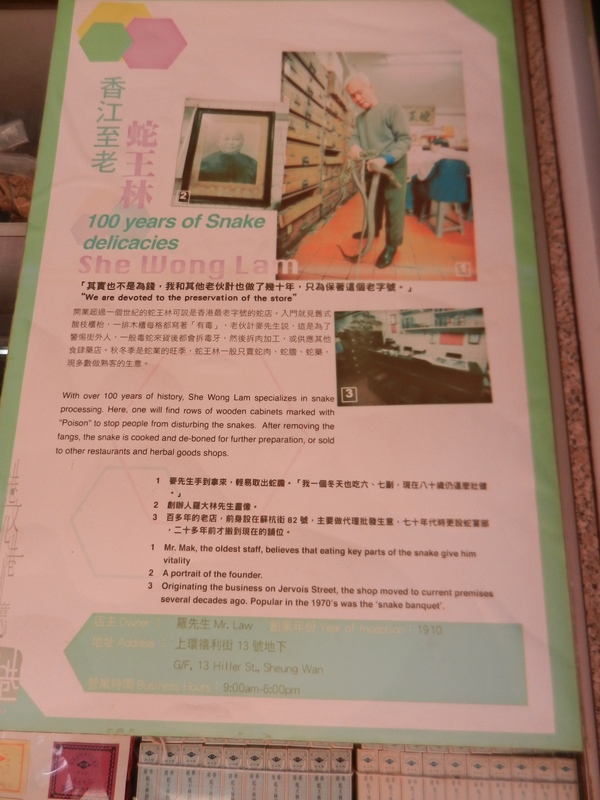 This shop sells live snakes of many different varieties as well as snake wine. Snake is thought to be good to eat in winter as it is a hot food and introduces heat into the body. Depending on the mood of the men working in the shop, you may be treated warmly and the doings of the shop explained, but don’t count on this as they can be quite grumpy. Perhaps too much heat as a result of the consumption of snake? 11. If you travel east (toward central) return to Wellington Street. 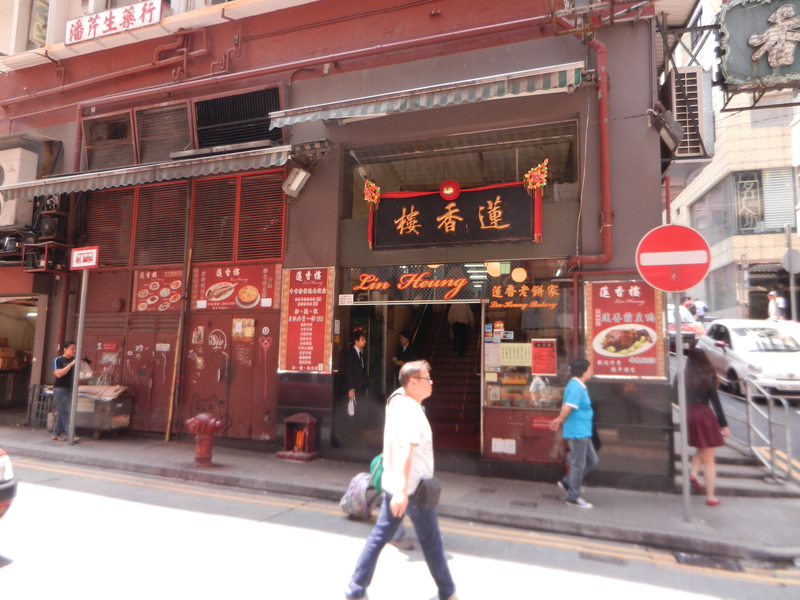 On the left you will find Lin Heung Tea House. This is a traditional Dim Sum House, complete with trollies and the competition that comes with trying to get the best items before the more experienced diners. The recommendation is to go to the Tea House before 11 am as it is less busy and, therefore, less difficult to get your meal. The tea house has been around since the 1920’s and has, since then, made little effort to change its practices. Do not expect to find an English menu or much English language support from the staff. You may also want to swat up on what the various dim sum items are before going, as some items may be beyond what westerners might consider food (I had a friend once refer to eating here as a bush tucker trial). Personally, I quite like to play Dim Sum Snakes and Ladders, where sometimes you get a winner and sometimes not so much. 12. The tour is now finished. As you head back to the MTR station or to the tram to go elsewhere consider that the street where the tram runs was once the shoreline. Everything beyond is reclaimed and has appeared since the 1970’s. What a different view this would have been then. There is a mock up of the changing skyline and shoreline at the Museum on the Campus of Hong Kong University. In the not so distant future, you will be able to catch an MTR up to the University, but for now you will need to find other transportation. It can be walked, but is further to the west and very much uphill. This entry was posted in Food, Hong Kong and tagged central, food, history, Hong Kong, Markets, MTR, self-guided tour, Tourism, Travel, visit, walking tour by geofoodie. Bookmark the permalink. I love all your foodie adventures! Someday I must join you! 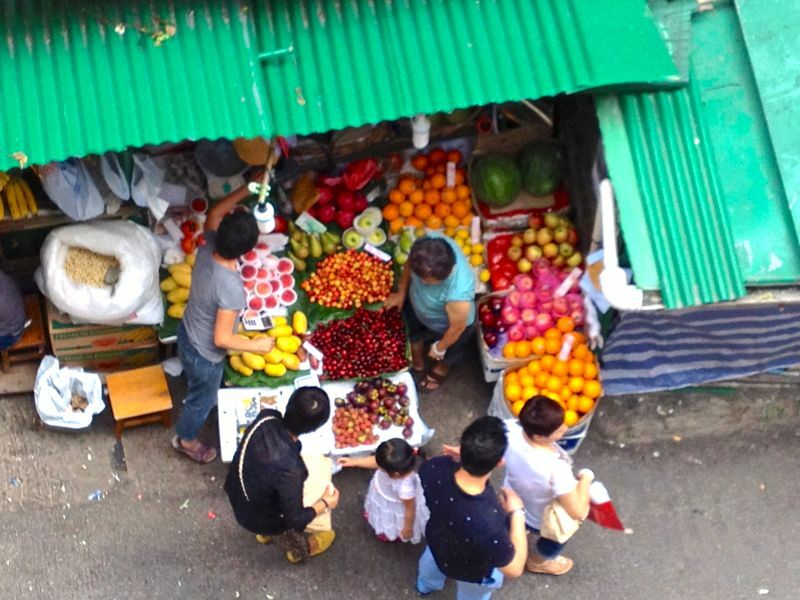 I’m all for a field course to Hong Kong, particularly if it involves exploring Hong Kong markets with you!